Every first Saturday in May I grab my bourbon and mint. Why? Because I am making Mint Juleps to enjoy while I watch the Run for The Roses, also known as The Kentucky Derby. The Mint Julep has been the official drink of The Kentucky Derby for nearly a century and I'm all for tradition. To a point. Yes, I have flouted Derby cocktail tradition many times in the past with a Blueberry Mint Julep, a Mint Julep Martini and, recently, a Pineapple Mint Julep. 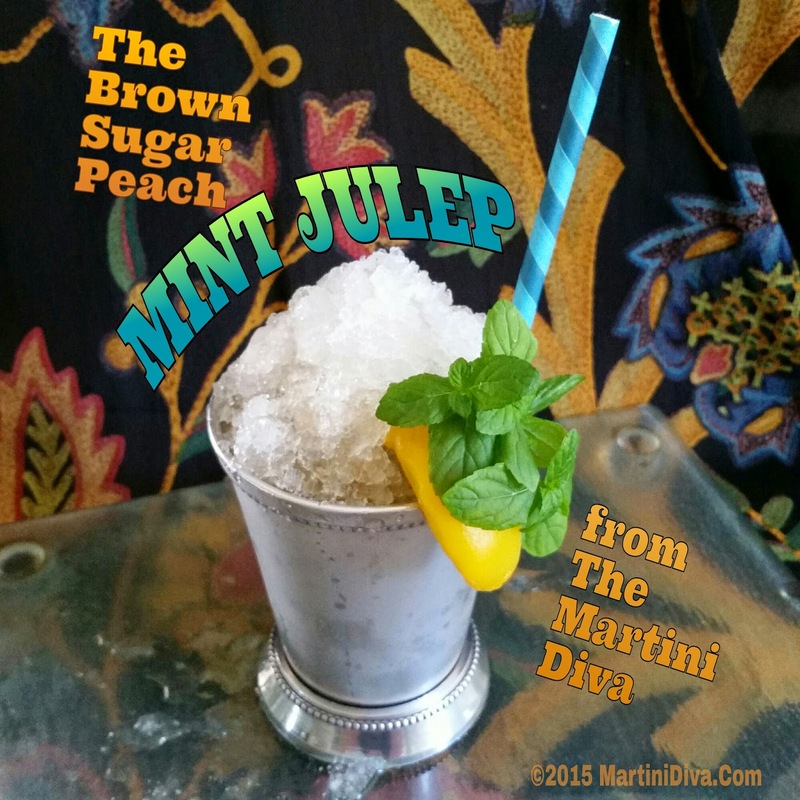 This year I continue my tradition of flouting tradition by creating a Brown Sugar Peach Mint Julep. TOOLS: Julep cup, muddler, measuring spoons and cups, food processor or blender, jigger, straw. DIRECTIONS: To mix your Julep add 12 to 15 mint leaves and the brown sugar simple syrup to the Julep cup and gently muddle to express the oils from the mint. Add the caramelized peach puree and your bourbon then stir. 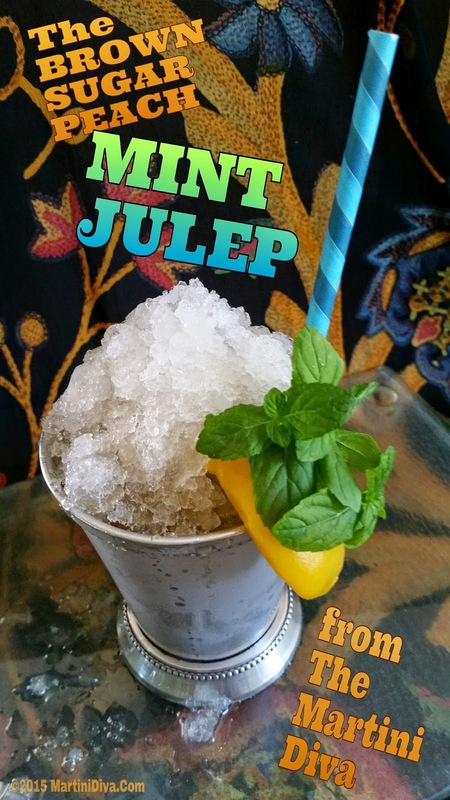 Use your food processor or blender to crush the ice then fill your Julep cup up until it's got a nice mound of ice above the rim. Garnish with the peach slice, mint sprigs, add a straw and enjoy! 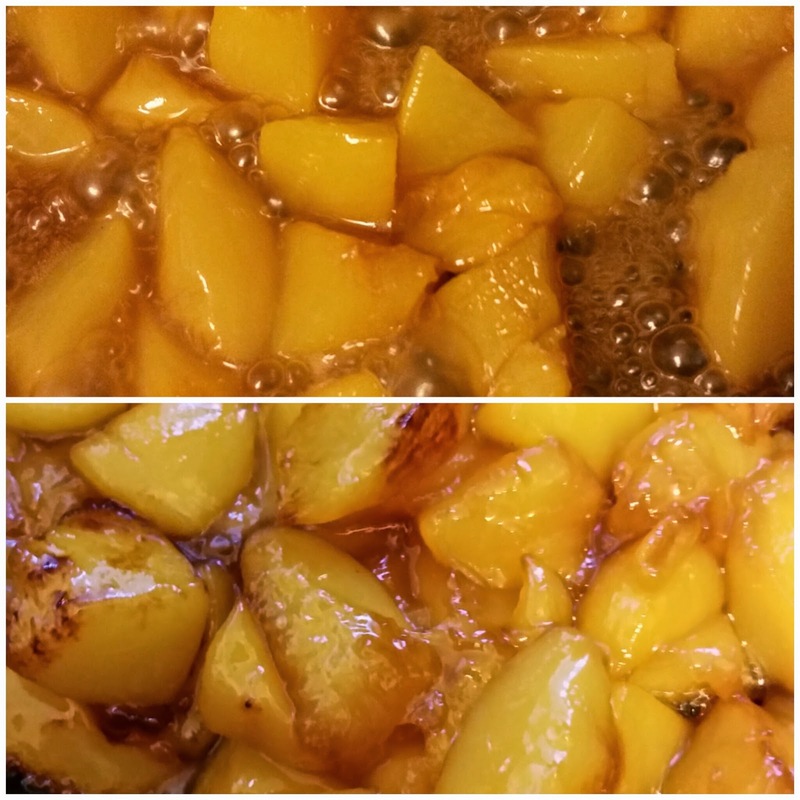 INGREDIENTS: 1 Small Can of Peaches (Or 3 fresh peaches) 1/2 Cup Brown Sugar 2 Tbsp. Unsalted Butter DIRECTIONS: Put aside 1 peach slice for each cocktail. Pan sear the remainder of the drained peaches with a the butter and brown sugar until nicely caramelized. Puree 1/3 a cup in a blender or food processor for each Julep. If there's any left, save that to spoon over ice cream later. Add a splash of bourbon to it and you'll think you've won that garland of roses yourself. The Kentucky Derby is the first race in The Triple Crown and is held the first Saturday in May at Churchill Downs in Louisville, Kentucky. The other jewels in the Crown are The Preakness Stakes, held at Pimlico Race Course in Baltimore, Maryland, and the Belmont Stakes, held at Belmont Park in Elmont, New York. The Kentucky Derby is the first in the Triple Crown of Thoroughbred Racing which is comprised of three races for three-year-old Thoroughbred horses. The rose is the race's official flower. The rose garland, now synonymous with the Kentucky Derby, first appeared in the 1896 when winner Ben Brush received a floral arrangement of white and pink roses. This gave rise to the Derby's nickname, Run for the Roses. Since 1930 "My Old Kentucky Home" has been played as the horses are led onto the track to the starting gate. It is performed by the University of Louisville Marching Band. The fastest winning time at the Kentucky Derby ever recorded was by Secretariat, who went on to win The Triple Crown in 1973. He set records at each race and is considered to be one of the greatest Thoroughbreds of all time. The Kentucky Derby is the only Triple Crown race to run consecutively since it's start in 1875. Smart money says this cocktail will be an odds on favorite right out of the gate. I admit it. 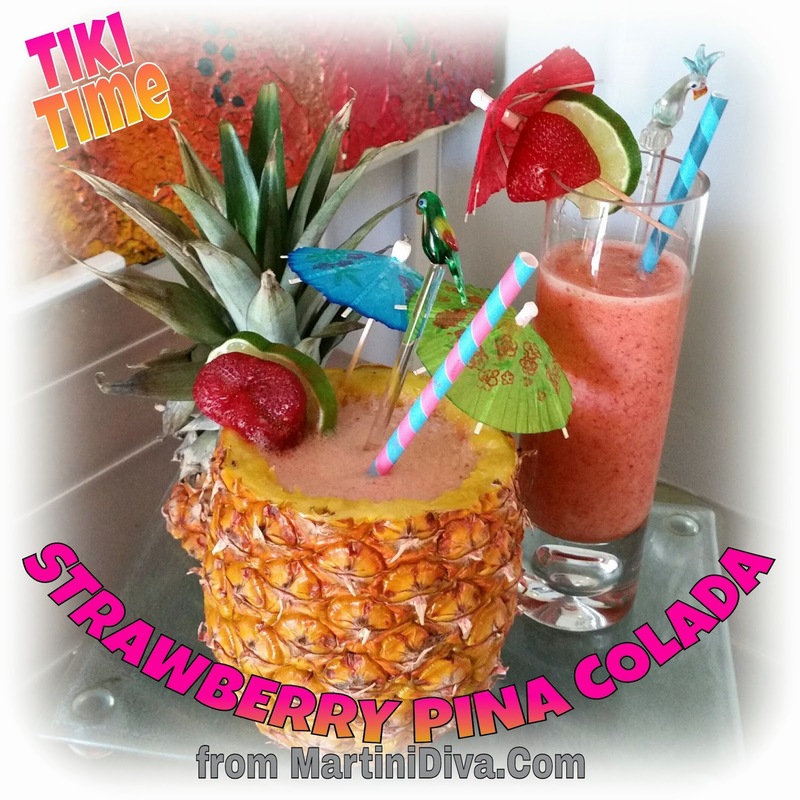 I love Tiki drinks and my favorite of them all is a Pina Colada. Many years ago, while doing art shows in Las Vegas, I discovered the Mirage's wonderful Strawberry Pina Colada. Every season I went back for my round of art shows (and gambling and play) I would go and order at least one. Now that I don't travel to Vegas as often, I had to come up with my own version. I do like a Pina Colada based on the standard recipe using rum, pineapple juice and cream of coconut but for this recipe I decided to replace the cream of coconut with the healthier option of coconut milk, use coconut rum to pop up the coconut flavor and add those Mirage inspired strawberries. And, since I was using fresh pineapple juice, I couldn't resist using the pineapple itself for a fun Tiki cup. 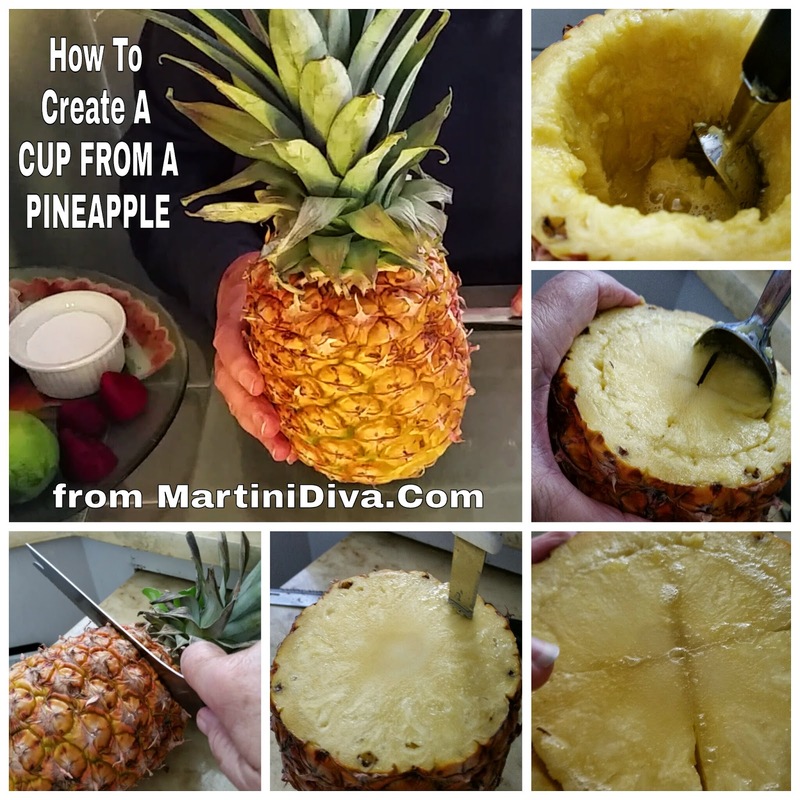 It's not as hard as you might think to create your own cup out of a pineapple and the thrill your guests get from the presentation is worth the effort, most of which you will go through anyway when gathering your fruit from the pineapple. Juice the fruit from your pineapple, either in a blender or a juicer. The blender will have more of a puree unless you strain it whereas a juicer will give you just the juice without pulp. Chill your juice in the refrigerator. *Here's a link from The Cooking Channel on to how to make pineapple cups. This is exactly how I made mine except I used an ice cream scoop to scoop out the pineapple. Save the top to seal your pineapple cup while you chill it. You can also use the pineapple top in your presentation. Put the tops on and set your pineapple cups in the refrigerator to chill. TOOLS: Knives, ice cream scoop, blender, jigger, measuring spoons, cocktail umbrellas. DIRECTIONS: Simply add all the ingredients except the garnishes to your blender and blend until smooth and creamy. Pour into your pineapple cup, garnish and serve. Now you're all ready to enjoy my version of a classic Tiki Cocktail. Yes, you can make these without alcohol and my video below shows you how. Aloha! Sure, there's lots of lovely fresh juice inside of that pineapple, but did you know there's also a lot of juice on the outside of that pineapple? When you trim down your pineapple to get at the fruit inside and throw away the skin and core you are throwing away a lot of pineapple juice. Below is an easy way to get that extra juice out. Tools: Knife, stock pot, large strainer, cheesecloth. Directions: 1. Give the outside of the pineapple a good wash and scrub with a veggie brush and rinse off. 2. Trim your pineapple like you normally would to remove the fruit. 3. Cut the green top off and set aside if you want to use it as part of your presentation, there's no juice in there. 4. Put all the skin and core into a stock pot, cover with water and boil for 30 minutes. 5. Strain the pieces out through a strainer, then strain this juice through cheesecloth to remove finer pieces. 6. You can add sugar if you like, I never do as this secondary juice is sometimes even sweeter than the juice from the fruit itself. It is also lighter and less acidic. 7. Chill and enjoy just as it is, use it for cocktails or even reduce it down and make pineapple simple syrup! Yes, you can use canned pineapple juice. You won't have the pineapple vessel as your cup so then you would serve this in a hurricane glass. A Pimm's Cup is basically a British version of fruity, alcoholic lemonade and is particularly great as a hot weather drink. For some reason, this is the cocktail I associate with England, probably because I had more Pimm's Cups while drinking in England then any other cocktail. It seems, after tea, Pimm's Cups are the second most popular English national beverage and everybody has their own version*. Pimm's Cup #1 is a gin based liquor containing a secret mixture of herbs, fruits and spices and was originally created by James Pimm as an aid to digestion. The Pimm's Cup #1 cocktail is comprised of Pimm's Cup #1, lemons or lemonade, mint, seltzer or soda water and fruits. Cucumber (yes, cucumbers are classified as fruit!) is the most common, though apples, berries and other assorted fruits can also be employed. When I went to buy a bottle I discovered there was a Pimm's Blackberry and Elderflower Liqueur version and curiosity got the better of me so I bought that instead of the Pimm's Cup #1. 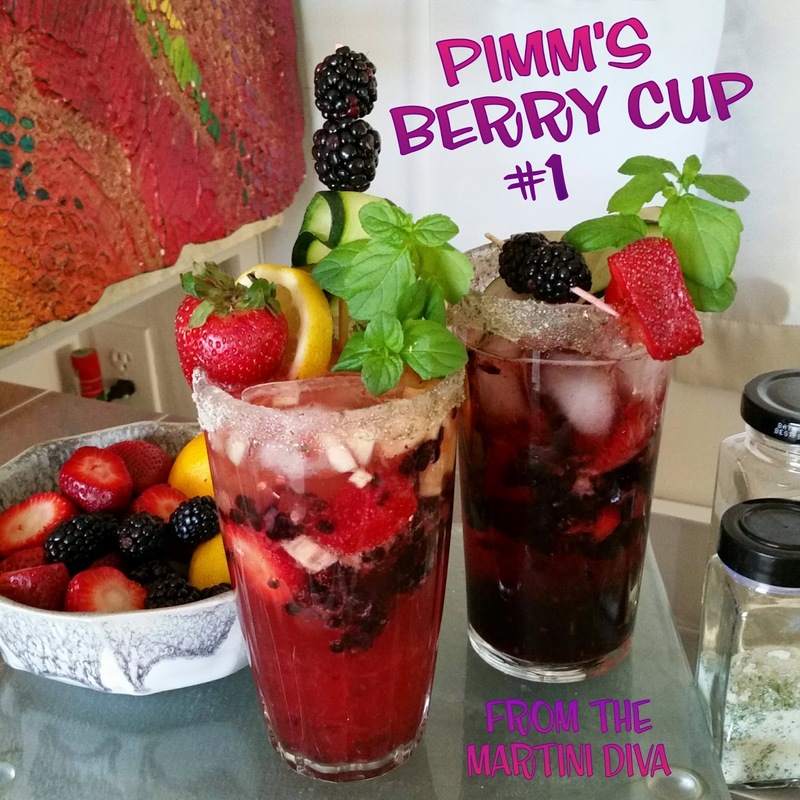 I'm very glad I did, I loved it and it gave me an opportunity to create my own version of a Pimm's Cup! As the weather heats up here in the Americas why not have a go with this summery and delicious cup of Martini Diva style English cheer. TOOLS: Tall Collins style glass, Paring knife, Muddler, Measuring cups, Jigger. DIRECTIONS: In your tall glass muddle the half cup of fresh blackberries, the 3 or 4 strawberries, the diced cucumber, a few mint leaves and the mint simple syrup. Add your ice, pour in the Pimm's and lemon juice, stir then top off with your soda. Slide a cucumber slice down the inside of the glass, garnish with a few blackberries, a strawberry, a lemon wedge and the mint sprig then enjoy! CAN THIS BE A MOCKTAIL? Sure! 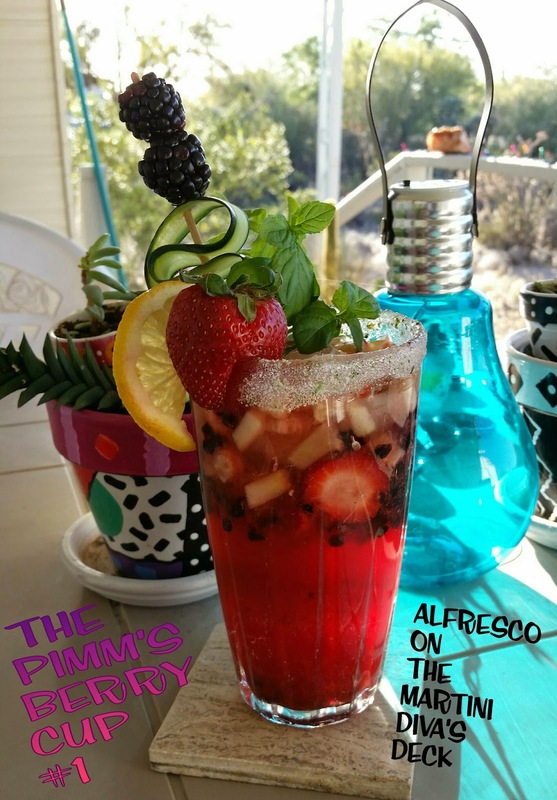 Just leave out the booze, but it's not a Pimm's Cup if you do so let's just call it a BERRY SPRITZER! SO, What to do with that fruit after you've finished the cocktail? The fruit from your Pimm's Berry Cup cocktail is basically macerated fruit** which is a popular dessert ingredient. Don't toss it away! You can give your guests a long spoon and let them enjoy the macerated fruit at the end of their cocktail or let them spoon it over ice cream, Mascarpone cheese or cake. 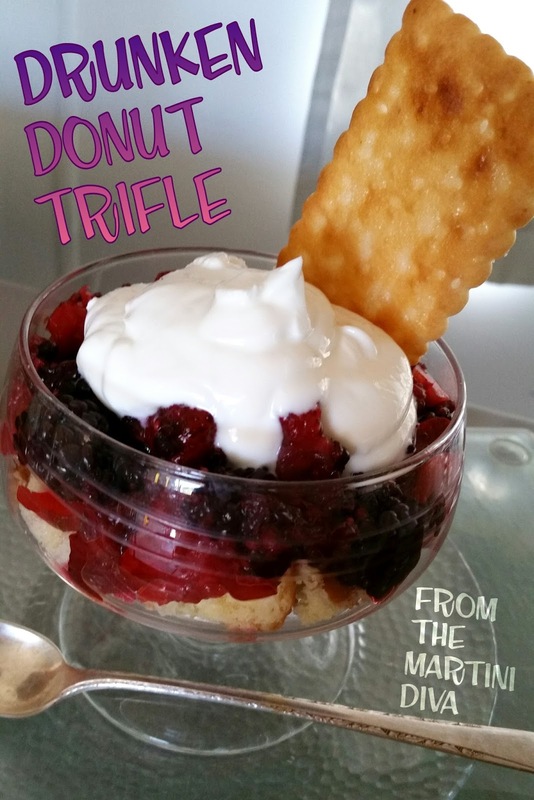 I saved mine and the next day I made a trifle with some day old donuts I had! Let it sit for a while to allow that dry, day old donut to soak up all the booze and juices before adding your creamy topping. * The Pimm's Cup is also a traditional drink of Wimbledon, popular at polo matches and is also very popular in New Orleans where they tend to really pile on the fruits! ** With reference to food, "Macerate" means to soften or become softened by soaking in a liquid. Generally fruits are macerated in a liquor, syrup, vinegar or sugar (the sugar draws the moisture out of the fruit which creates the liquid for maceration). As the fruits soak in the liquid they will draw in the flavors. It's like marinating meat, but for fruit! Sticking with my latest fascination for vintage and colonial cocktails, this drink is a tweak of Franklin Delano Roosevelt's Haitian Libation as described in an article from Vanity Fair. Leo Robitschek, who recreated that libation, used 1-1/2 ounces orange juice, 3 ounces dark rum, 1 egg white and a dash brown sugar in Roosevelt's original version. Being the rebel I am (just following in our forefather's footsteps), I had to tinker with that and make it my own. 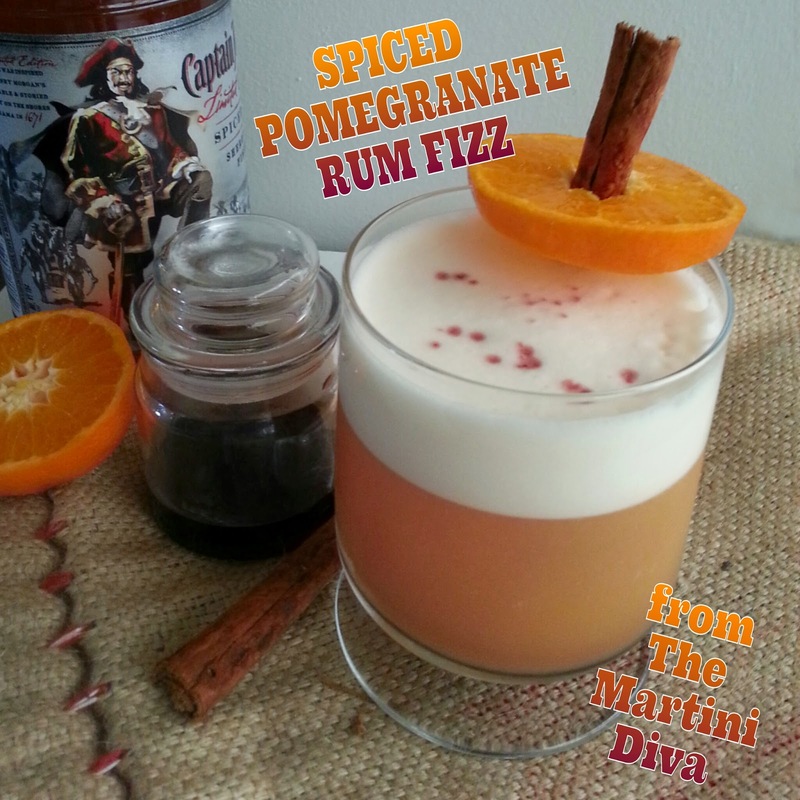 I replaced the regular rum with spiced rum, added powdered sugar, used pomegranate syrup instead of dark brown sugar* then added a dry shake to the mixing steps to get the high volume egg froth. I also adjusted the ratios to suit my personal preferences. 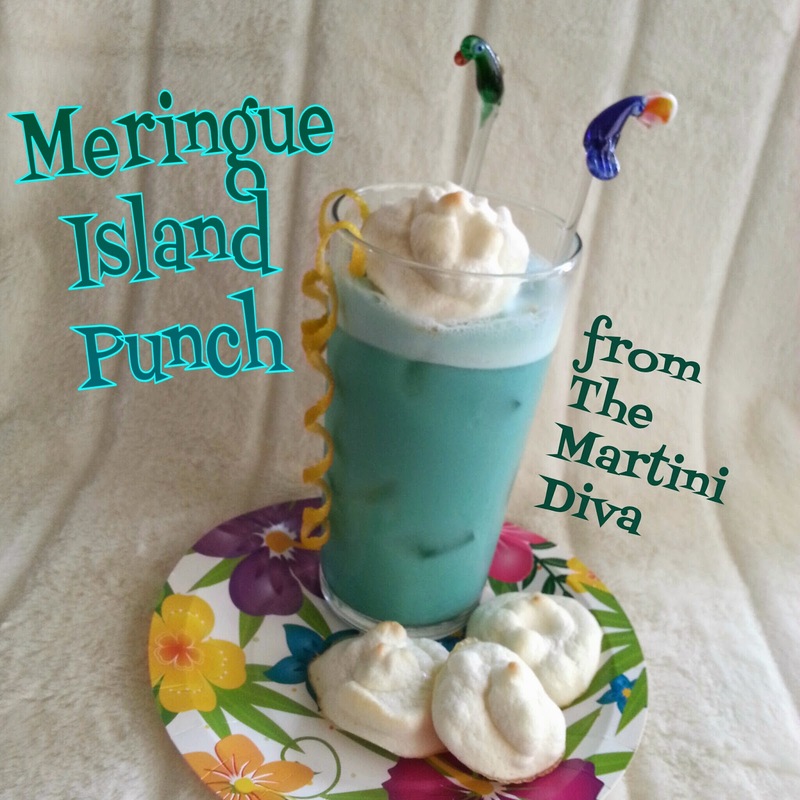 This, like my Meringue Island Punch as well as a number of colonial cocktails, also includes egg white - another recent craze of mine. Add the spiced rum, orange juice, egg white and the powdered sugar to a blender to emulsify the mixture and build the egg foam. Pour this into an ice filled cocktail shaker and shake until chilled. Pour into your chilled glass, add the pomegranate syrup over the top of the foam and shake off the last drops to float on the foam. 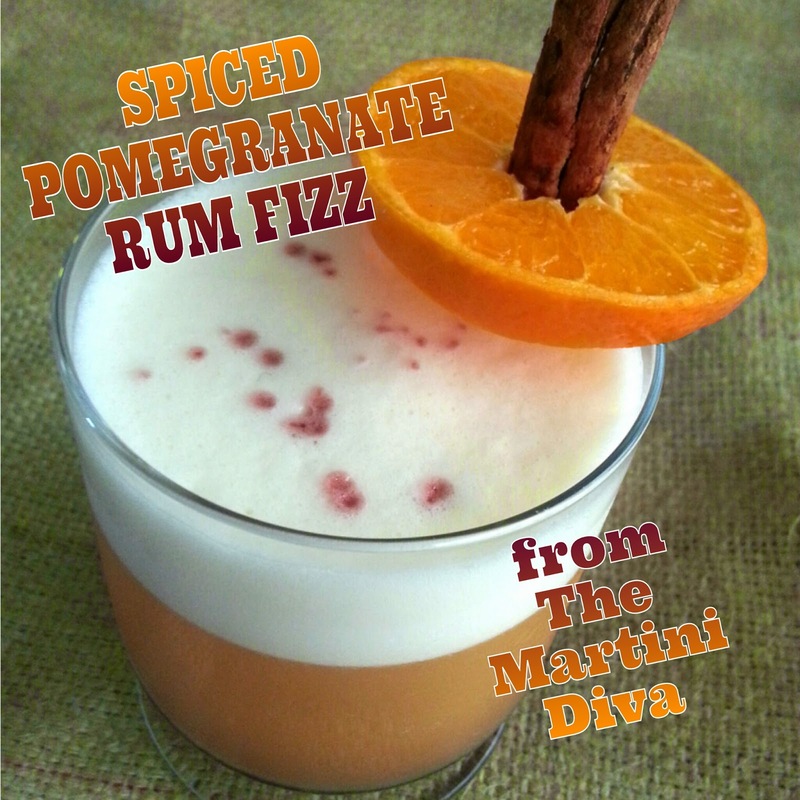 Garnish with a fun orange wheel and cinnamon stick and serve. Here's the techniques for making Pomegranate, and other, Simple Syrups. If this doesn't get your spirits all ready for a happy hour revolution I'm siccing the Red Coats on you. Unless you're English, in which case, mea culpa and apologies for the Red Coats comment! * Robitschek's recipe calls for dark brown sugar, which is basically molasses mixed with regular white cane sugar, and this pomegranate syrup has a definite molasses hint to it plus it brings in the flavor of pomegranate. There's a big trend these days for revamping antique cocktails, particularly recipes from Colonial America where the beginnings of the modern cocktail got its start. Being a huge fan of the history of cocktails I ventured into modernizing retro recipes a while back, starting with the Rattled Skull, my Sleepy Hollow inspired rendition of the colonial Rattleskull cocktail, then venturing into Shrubs aka Drinking Vinegars and Flavored Simple Syrups. For our Forefathers the mixing of libations was born from necessity, whether it be medicinal or palatable, for us it is a matter of the enjoyment of new combinations of tastes and textures, born out of a love of new experiences. The art of cocktails, like the art of cooking, is having a renaissance and exposing happy hour to the past as well as the future of mixology. From infusions, bitters, syrups and shrubs, evolved from ancient herbal remedies and preservation techniques, the cocktail has passed through the ages to a rebirth of exciting new and reimagined liquid enjoyment. It's probably the best time for cocktail enthusiasts in drinking history as even the most pedestrian establishments feature signature cocktails made with fresh, quality ingredients and bartenders embrace craft cocktails by venturing into new flavor combination horizons. For someone like me it's a chance to bring my cooking skills and food knowledge to my bar as well as my kitchen, aided by my love of history. Bake (or buy) the meringue cookies. If you're baking plan ahead. They take a few hours to bake. 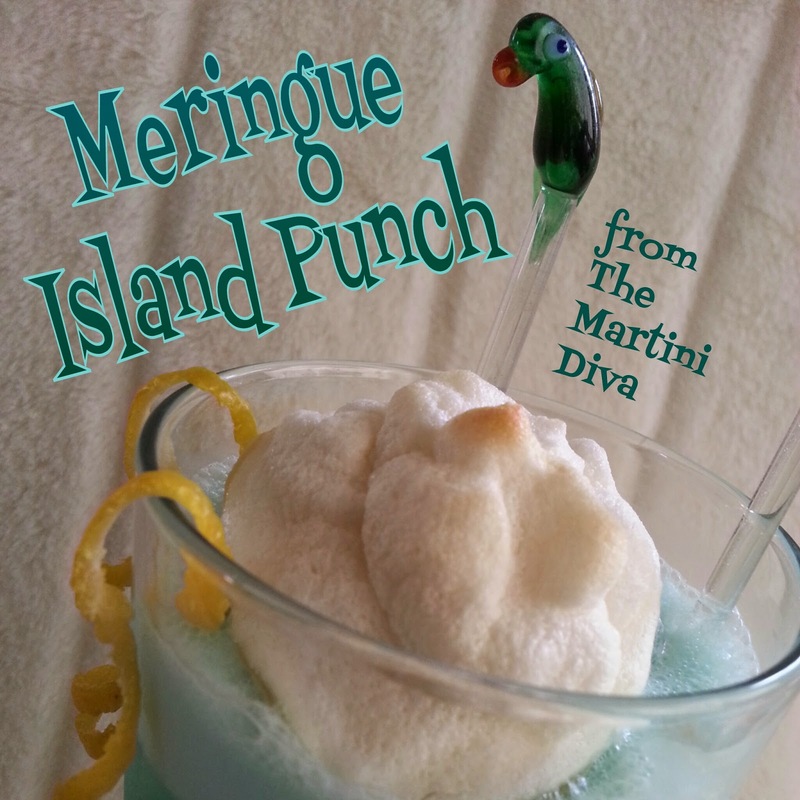 Add the rum, Blue Curacao, orange juice, lemon juice, pasteurized eggs white and the pineapple sorbet to a blender and blend - without ice* - until foamy. Pour this mixture into a cocktail shaker with ice and shake until chilled. Pour the cocktail mixture into your glass, top off with champagne, stir. Place your meringue cookie on top and garnish with the orange twist and serve. * Blending or shaking without ice is referred to as "dry shaking". Boysenberries* happen to be a favorite of fruit of mine but finding them fresh at any market is nearly impossible, most likely because the boysenberry is not as widely cultivated as other vine berries. My mom and I fell in love with boysenberries when we first experienced them in Boysenberry Pie at Knott's Berry Farm's Chicken Restaurant back in the early 1960s. They had preserves and jams too so we took home jars of those as well. When I moved my folks up to the Northern California wine country, Mom and I discovered a local farm that grew boysenberries and we continued our boysenberry love affair. Sadly, it's nearly impossible to find boysenberries here in Tucson, but to this day a jar of Knott's Boysenberry jam is always in my refrigerator, it's a tradition that keeps my mother's memory close. When I stumbled on a few bags of frozen boysenberries at a specialty grocery stores a few weeks ago I nearly cried with joy! Then I immediately grabbed up every single bag on the shelf! Yes, I was going to make pies and cobblers and crisps, but first I was making a cocktail! This one's for you, Mom. I truly wish you were here to share it with me. INGREDIENTS: 3 Oz. Spiced Rum 1 Oz. Kirschwasser (Kirsch) 3 Oz. 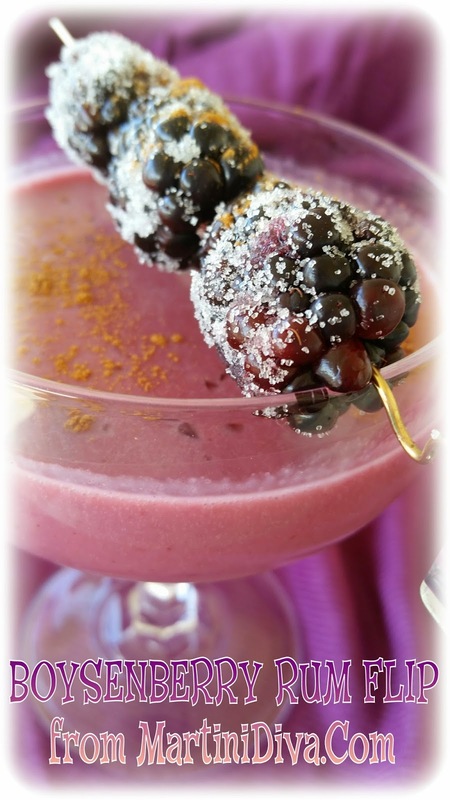 Fresh Boysenberry Juice 4 Tablespoons Pasteurized Egg White 2 Tablespoons Mandarin Simple Syrup 1- 1/2 Oz. Cream Dash of Cinnamon Mandarin Spiral Twist Sugar Dipped Frozen Boysenberries (Makes 2 full cocktails) TOOLS: Juicer, blender, medium metal strainer, cocktail shaker, channel knife, jigger, measuring spoons, coupe cocktail glasses. DIRECTIONS: Chill your glasses in the freezer. Cut your spiral out of the Mandarin heal with your channel knife, set aside. Juice or blend your boysenberries then strain out the tiny seeds. Add the spiced rum, Kirsch, boysenberry juice, egg white, cream and Mandarin simple syrup to the blender and blend until the liquid volume doubles or about 30 seconds on puree setting. Pour half the mixture into a cocktail shaker filled with ice, shake until chilled then pour into your chilled coupe. Repeat with the remainder into a second coupe. Dust top of meringue foam with cinnamon, add a few sugared, frozen (or fresh if you can get them!) boysenberries to a cocktail pick and set this across the glass then drape the Mandarin twist across the pick and serve. 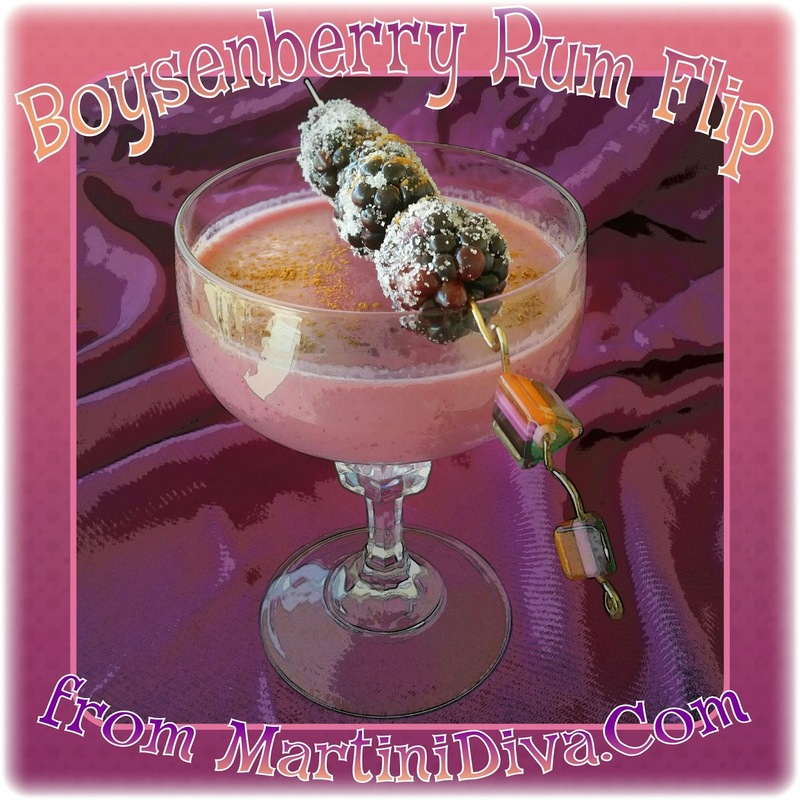 Sharing my Boysenberry Boon with a visiting friend: * WHAT IS A BOYSENBERRY? A Boysenberry is a cross between a European Raspberry, a Common Blackberry and a Loganberry. 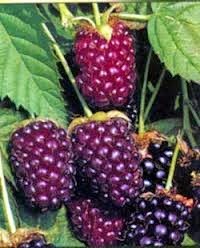 They were originally cultivated by Rudolf Boysen who had gotten a "Lubbenberry", a cross between a dewberry and loganberry from John Lubben and began experimenting with several cross varieties on his Northern California farm. In the late 1920s the rumor of these unusual berries was brought to the attention of Walter Knott, of Knott's Berry Farm fame, by George M. Darrow of the USDA and both men traveled to Lubben's abandoned farm, found a few neglected vines and transported then back to Knott's farm in Buena Park, California where Knott nursed them back into production. Knott renamed the hybrid Boysenberry in honor of Boysen and became the first to commercially cultivate the berry. 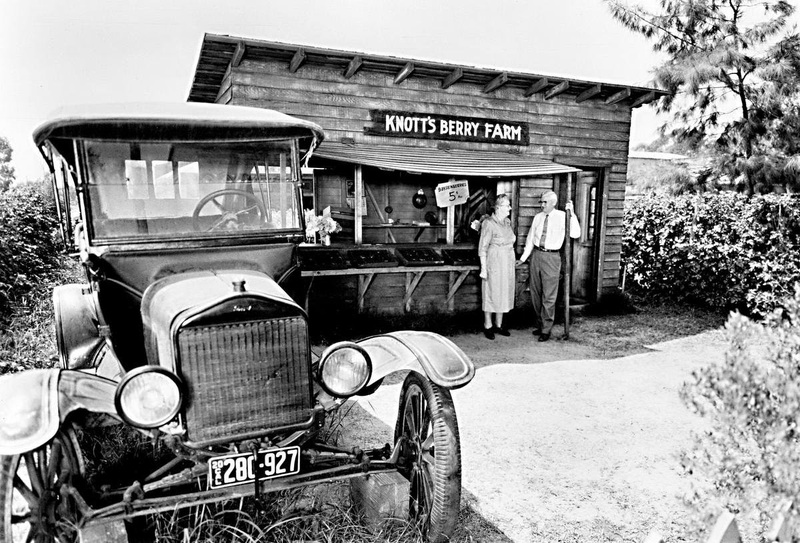 His wife eventually began to preserve the fruit in jams and jellies and sell Boysenberry pies at her tea shop at their farm's roadside stand, the same farm that would become the world famous Knott's Berry Farm and Amusement Park. Today Knott's Berry Farm is still synonymous with Boysenberries, they even hold a Boysenberry Festival each year, and still serving up their famous Boysenberry Pie along with the best fried chicken I've ever eaten at Mrs. Knott's Chicken Dinner Restaurant right there at the park. Boysenberries are also featured for sale at the park in many of Mrs. Knott's original recipes for jams, jellies and other products, though, sadly, no longer under the Knott's trademark which is now owned by Smuckers. 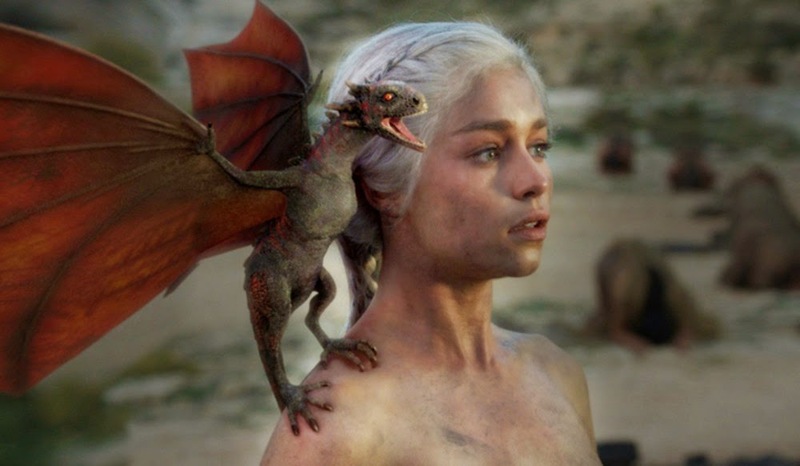 I'm a Game of Thrones fanatic and my favorite character is Daenerys Targaryen because she is The Mother of Dragons. I've been obsessed with dragons since I started reading Anne McCaffrey's Dragonriders of Pern series more than 4 decades ago. I even got a pair of mated cockatiels because they reminded me of the fire lizards in the series, that's pretty dragon obsessed! I wasn't all that interested in Game of Thrones until I saw the dragons, then I had to binge watch the entire series, get HBO and read all the books. 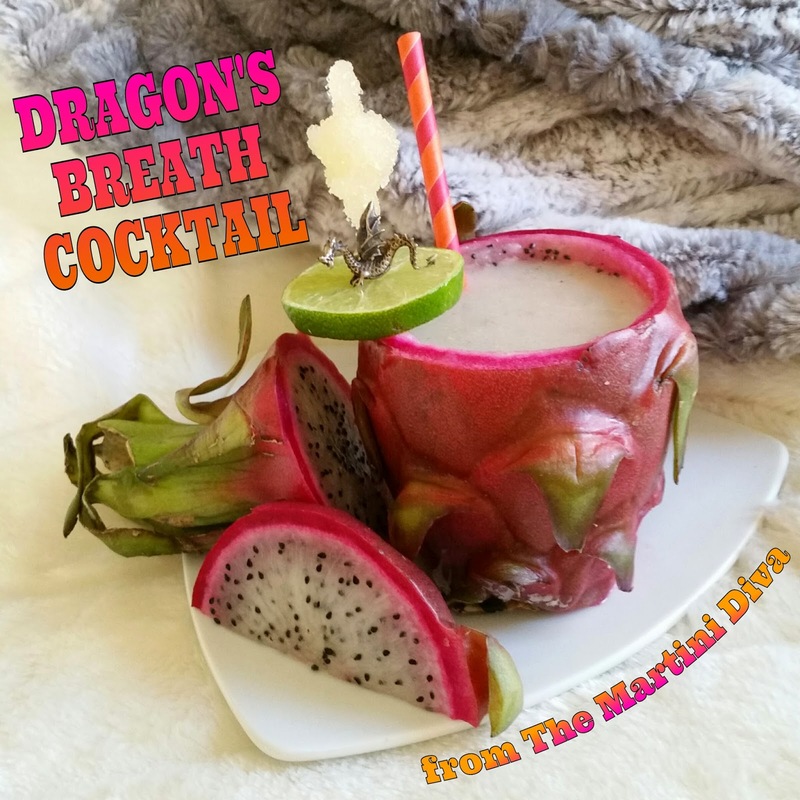 Now I'm hooked and I love it for more than just the dragons, but the dragons are what drew me in so my first Game of Thrones cocktail has to be all about the dragons. I'm sure you can guess where I'm going from there? Yes, you guessed it, Dragon Fruit*! TOOLS: Knife, Large Spoon, Measuring Cups and Spoons, Blender, Cocktail Shaker, Jigger, Zester. To prepare your dragon fruit cut the top off with a knife, then slice off a quarter inch disc from the fruit itself. put both aside as a garnish. Then slice off a bit of the bottom to create a level base. Take your spoon and gently scoop out the meat from the inside of the fruit leaving enough shell to create a cup. Add the dragon fruit meat to a blender and pulse until pureed. Add the pureed dragon fruit to your cocktail shaker then fill shaker with ice. Pour in the spiced rum, coconut rum, coconut milk, lime juice, pineapple simple syrup and the zested ginger and shake until chilled. 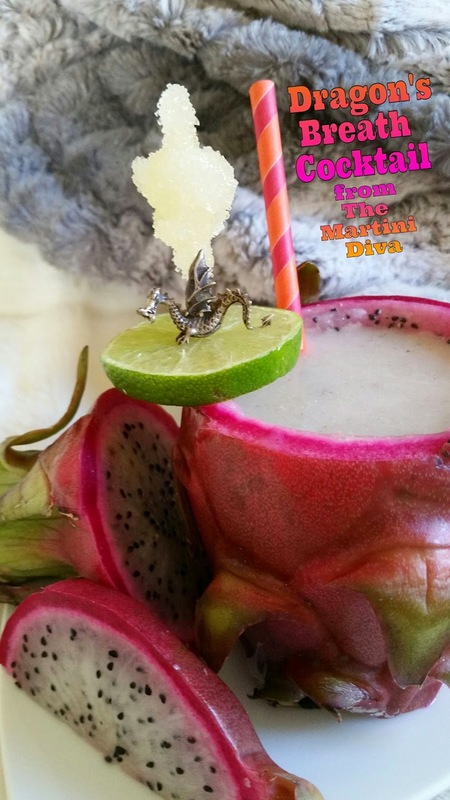 Pour into your hollowed out dragon fruit, garnish with a slice of lime and the ginger sugar crystal stick and serve. I've used the Hylocereus Undatus variety which has a deep pink skin with white meat. There is also a variety called Hylocereus Costaricensis which has a deeper red skin with a brilliant purplish red meat, as well as a white skinned, yellow meat variety called Hylocereus Megalanthus. All varieties are speckled with tiny, edible black seeds in the meat. Just so you aren't shocked when you go to buy your dragon fruit, I paid $5.99 a pound and my fruit weighed a little over a pound and a half! *DRAGON FRUIT, aka Pitaya or Pitahaya, is the fruit of a variety of cactus (Hylocereus) originally native to Mexico. One variety, the Stenocereus, is native to my own locale here in Tucson and it's fruit, the sour pitaya or pitaya agria, which is found in the Sonoran Desert, was an important food source for Native Americans and is still harvested by locals in the Northwestern portion of Mexico. The Pitaya Dragon Fruit was transplanted to Central America, then introduced throughout the Old World by travelers who brought it back after exploring the Americas. It is now primarily cultivated in East Asia, South Asia and Southeast Asia though it's cultivation is extending beyond those borders as it's popularity increases. The Hylocereus cactus blooms at night, producing a fragrant, white flower called a moonflower which is also known as The Queen of the Night. Taking the traditional and permitted ingredients of the Passover Seder I've attempted to create two cocktails that are KFP or Kosher for Passover. My intent with these recipes is to give those who observe Passover some delicious cocktail additions to the Four Cups of Wine. Though I did extensive research and have experienced many a Passover Seder with friends, I am not of the Jewish faith and, therefore, welcome any corrections or additions on any errors or misinformation in this post. L'Chaim! WHAT IS PASSOVER? Pesach or Passover commemorates the liberation of the Israelites from Egyptian slavery and lasts seven or eight days from the 15th day of Nisan. Zeroah - A lamb's shank bone symbolizing the ancient Passover sacrifice. Beitzah - A roasted egg symbolizing the temple sacrifice made every holiday when the temple stood and the continuing cycle of life. Haroset - A paste of fruit, nuts, wine or honey that symbolizes the mortar used to construct buildings for Pharaoh. Maror - A bitter herb (often horseradish) used to represent the bitterness of slavery. Karpas - A green vegetable (often parsley) that represents the initial flourishing of the Israelites during their first years in Egypt. Salt water - Symbolizes slaves' tears and is normally used to dip the karpas (green vegetable) in. The seventh food, Matzah (Matzo, Matzot) is the unleavened bread which represents the haste of the flight from Egypt for in the haste to flee Egypt there was no time for bread to rise. 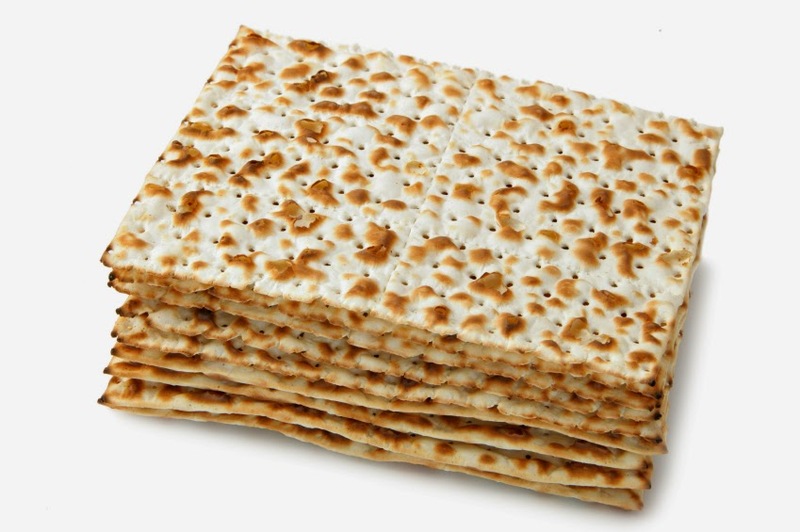 Matzo, though made from wheat, is unleavened and closely supervised to ensure it is baked no longer than 18 minutes. The Three Matzo are served on a separate plate to represent Kohen, Levi, and Yisrael. Though most liquor is not KFP (Kosher for Passover), primarily because of the use of grains in the distillation, aging or fermentation process, there are some which are permitted if the Kosher requirements are met. Kosher wines and Kosher potato vodkas are acceptable, though many Passover observers only drink KFP wine. For more thorough information there is an excellent article on Kosher spirits over at The Alcohol Professor. As with the Passover meal, if you are serving these cocktails to someone who keeps kosher you must make sure you use ingredients that have the KFP certification. PASSOVER BULLSHOT Serve warm 1 Oz. KFP Potato** Vodka 1 Oz. Chicken Broth Dash of Horseradish Garnish with a Sprig of Parsley dipped in Saltwater. Add the dash of horseradish to a 2 ounce shot glass. Warm the broth then pour over the horseradish. Add the vodka then garnish with the salt water dipped parsley. Serve with a roasted egg. SEDER WINE COCKTAIL 6 Oz. Kosher Wine Tbsp. Apple Chunks 1/2 Tsp. Cinnamon Honey Finely Ground Nuts for Rim Ice Rub the rim of an 8 ounce collins glass with honey and dip into the finely ground nuts. Muddle the cinnamon and apple chunks in the bottom of the glass, add ice then pour in your Kosher wine. Serve with a cinnamon dusted matzo cracker. 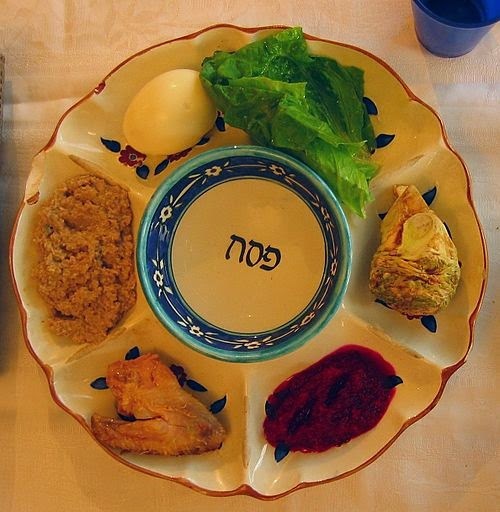 Chag Kasher V'same'ach - Have A Kosher and Happy Passover! 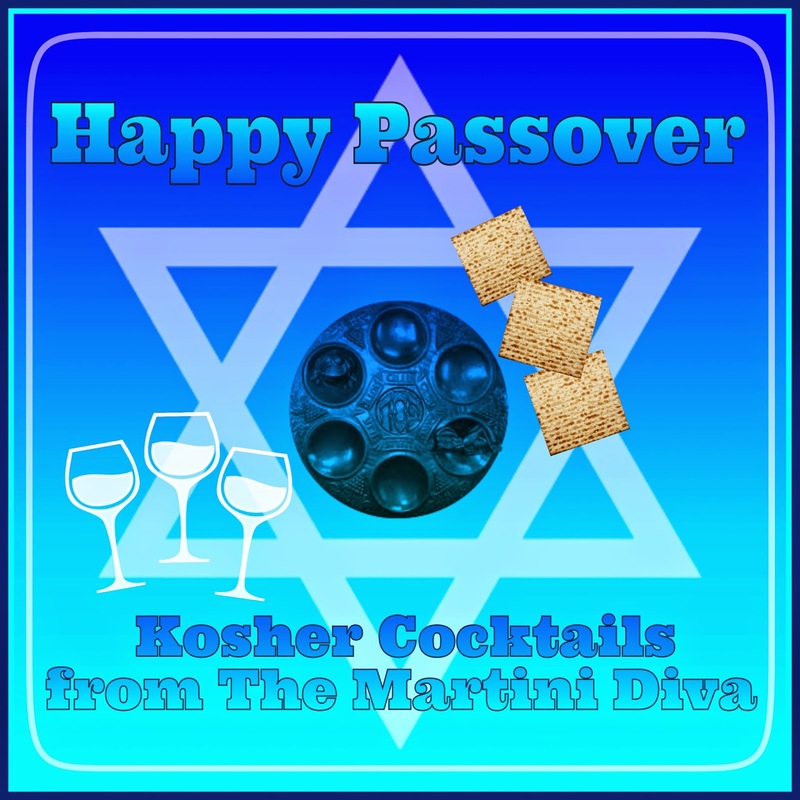 ** Vodka made from anything other than potato uses grain and anything with leavened grains is considered chametz and is prohibited during Passover. In particular, wheat, rye, oats and spelt are prohibited if they’ve had contact with water/moisture for longer than 18 minutes. During distillation it is possible and probable these grains would be exposed to water for longer than the prescribed time. DIRECTIONS: Juice 4 large carrots and set aside. Dip your finger in the honey and rub the entire rim of the cocktail glass, dip into your Easter sprinkles then chill glass in the freezer. In a mixing glass add your fresh mint leaves, grated ginger and apple juice and muddle to release the mint oils and ginger into the apple juice. Stain the apple juice into your blender. To the blender add your coconut rum, carrot juice, orange juice, and egg white then blend on liquefy for 30 seconds or until the liquid volume has doubled. Pour this into your cocktail shaker filled with ice and shake for additional 30 seconds. 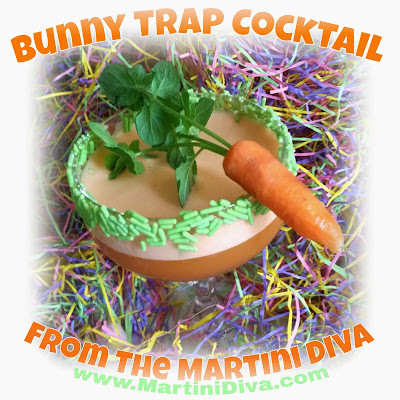 Pour into your cocktail coupes and garnish with a mini carrot and mint sprigs. 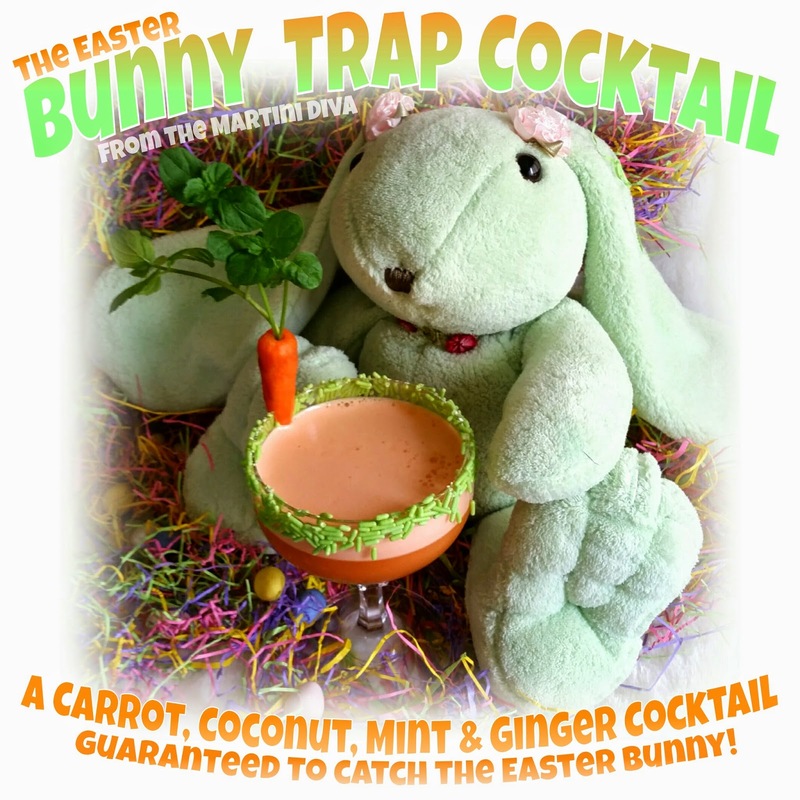 If this doesn't catch the Easter Bunny nothing will!